Contents are the heart of Dub parking sites. They populate your domain with relevant pages, which will drive engagement and traffic. But a Dub parking site doesn't just list contents, it also comes with a host of other features which support contents to make it even more engaging for your visitors. All of these things can be configured in Site > Settings > Content in your parking site admin panel. In this document, we will go through each of these settings and explain what they are. If you're familiar with content aggregation sites (e.g. Reddit) then you will be familiar with content voting. 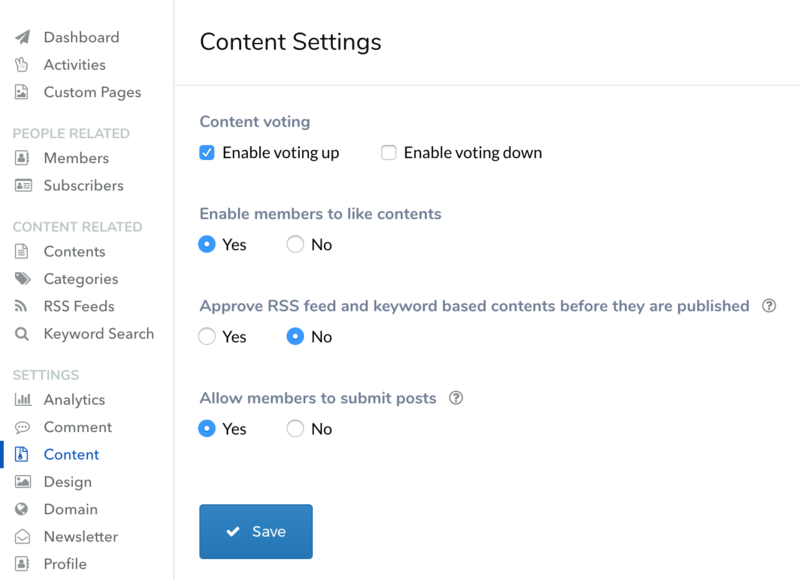 It's a feature where users can vote up or down on the content depending on how much they like the content. Voting is available only for registered members and you can allow either voting up or voting down. If you allow voting, contents will be ordered with votes considered. Members of your parking site can also view their voted contents, which will be available via a menu item. Liking or bookmarking is another way for your members to show their engagement with your contents. Unlike voting, liking is a way of your visitors to bookmark their favorite contents on your site. Contents are usually discovered via either RSS feeds or keyword searches. By default, they are displayed on your site automatically. However, if you wish to control the quality of the contents a bit more, you can manually approve these discovered contents before they are displayed on your site. If you set this option to Yes then you will need to go to the content management in your admin panel and approve the ones that you like. In addition to sourcing contents from RSS feeds and keywords, Dub parking site also gives you an option to actually submit posts. Set this to Yes and you will see a Submit button on your site, which is available only for your members. You will also see a link called Bookmarklet on your site. This is a shortcut plugin which your members can install in their browser. When they visit a page which they want to share on your parking site, they can click this button and a content will be pre-populated with its details, making things easy to submit. Allowing post submission also requires your approval by default. You, as an admin, will receive an email when a new post has been submitted by your member, at which point, you can review and decide whether to approve or reject. Though it requires a little bit more work, allowing your members to submit posts is a great way to turn your domain into a community where visitors of your domain become active rather than passive. By submitting their own post and seeing how other people engage with it, they will feel more ownership on your parking site and return as an active member, helping your parking site to grow over time.